Available Colors: Red, Blue, Green, etc. Keeping in mind ever-evolving requirements of our respected clients, we are offering a premium quality range of Mobile Advertising Hoarding. 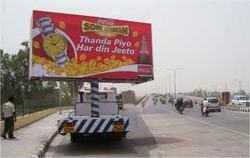 Owing to our in-depth knowledge in this domain, we are specialized in providing Mobile Hoarding. As mobile internet usage continues to grow dramatically, businesses need to add focus to mobile marketing to stay competitive. Mobile search capabilities and shopping options quickly have advanced to an unprecedented level. At Pragati Advertisers, we provide custom solutions to ensure that client brands stay relevant. We are a unique name in the industry to provide our prestigious clients an exclusive range of Mobile Hoarding Board.